Lovely straw yellow/pale gold in color. Lightly floral, citrus and pear notes on the nose follow through on the palate and finish impeccably clean. Elegant, with luscious weight and restraint all at once. Underlying subtle minerality adds complexity. Beautifully integrated. Dry with long finish. Flinty, with light citrus, this could stand up to a baked whole fish or pasta & seafood with light cream sauce, as well as being an ideal aperitif with hors d’oeuvres. This ROCKS! Soave is one of Italy’s most famous white wines. The Tessari family runs the Suavia winery, located in the Veneto region in northeast Italy between Lake Garda and the Adriatic. 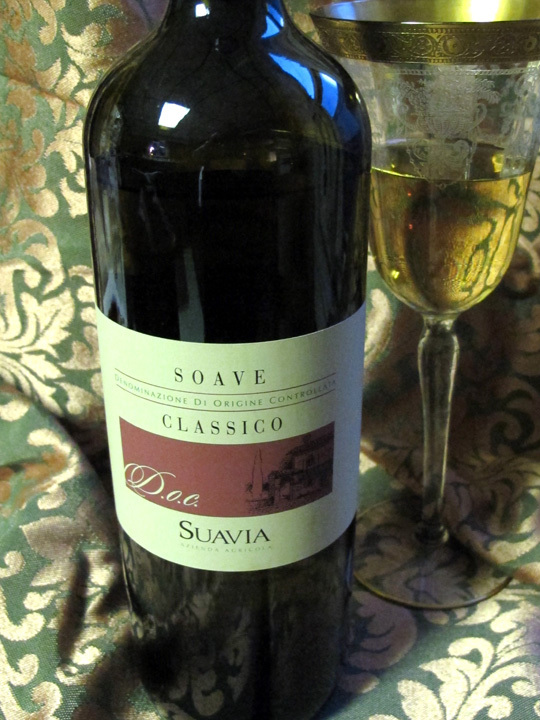 Since its founding in 1982, Suavia has become synonymous with Soave and one of the appellation’s benchmark wineries. Great care is taken from the very beginning with the vineyard, with the Soave Classico terroir and very old, select rootstock. The richness and complexity of Suavia’s volcanic soil endow the wines with characteristic minerality and flinty notes. Sunny days and cold nights help create layered aromas and nuances. $14.99 at Old Port Wine Merchants on Commercial St. Or inquire at your local store to order through Pine State Beverage Co. (from VIAS Imports) in Maine.